Are we proud to be Canadian.. or to drink it?? For the past couple of weeks, Olympic fever has gripped the world. And no country has been more in love with this Olympics than Canada. After all, Vancouver hosted the event this year, so it stands to reason that Canadians would be full of pride.. and liquor. This is my lucky friend Stephen who actually WENT to the Olympics. The outfits rivalled those at the bar.. I had the opportunity to catch some of the events.. not all.. missed the opening ceremonies, among other things. However, I was able to catch the piece de resistance of the games.. the Gold Medal Hockey Final. I was not fortunate enough to attend (Unlike my friend Stephen Ross… see photo) So the next best place to watch such an event.. Bobby O’Brien’s Irish Pub (@bobbyobriens on Twitter). My partner in crime for this event was my lovely friend Meg (@meggroff). We arranged to meet at Bobby’s just after the first period… found ourselves a table and sat back to enjoy the show. Oh, and the hockey. Apparently being a proud Canadian and supporter of the men’s Olympic hockey team involves beer. Lots of beer. Oh, and that was just us. I almost felt ashamed drinking my imported Stella… but I digress. There were many in full “proud Canadian” gear.. and Meg and I chose to give them various names. Our favourite was Captain Jesus Canada.. a shortish young gentleman who bore a strong resemblance to Christ and was outfitted in Canada jersey and the requisite Canada flag cape. Captain Jesus would not walk around the bar, but rather run.. simulating the effect of flying.. his long locks and cape billowing in the ensuing breeze…. I haven’t read the “Hockey Fan Handbook”, but apparently to show your nationalistic pride, it’s appropriate to toast the team with various shots of Jager, Tequila or whatever shooter you prefer. The prouder you are of Canada, the more shooters you consume. (Meg and I may be verging on being traitors as we did not have any.) The shooters provide the following positive effects: louder cheering and chanting, higher, harder high fives… louder screams of joy when Canada scored.. the notion that it’s appropriate to shake a beer and let it explode everywhere.. and of course the illusion that the players can actually HEAR you when you shout at the tv. 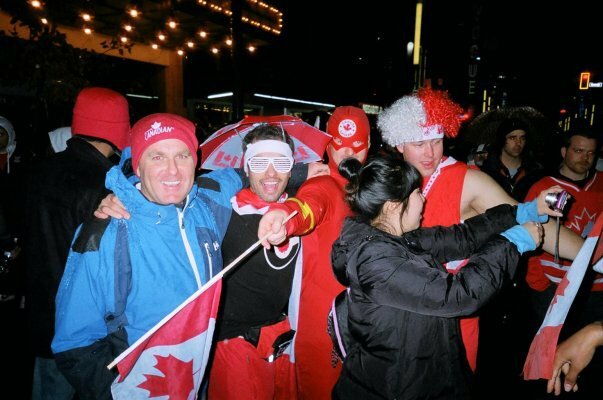 Many many others in Bobby’s were also in full Canada regalia and creating much people watching pleasure for my partner in crime and I… Indeed, it was THE place to be to watch grown men nearly cry like newborns when the US tied it up. But, as we all know.. it was worth it.. Canada triumphed. You have not witnessed true joy until you’ve seen one grown man (Captain Jesus) run across the bar and leap into another man’s arms (Chantman)… I almost wish I had recorded that moment so that I could play it back for you in slow motion with an appropriate swelling soundtrack…. All in all.. a very good time.. Canada won.. Meg and I witnessed much comedy, camaradarie and man love.. and there was beer. Oh, and wings. Although we didn’t dress like it, we were, and are, proud to be Canadian and proud of our athletes. And happy we weren’t the ones cleaning up the bar…….